You'll see in the Apple and even now Android worlds that wired headphones are falling out of fashion. Sadly. But not in my household and not in the world of Windows Phone and Windows 10 Mobile, with every single handset ever made having a 3.5mm jack. And striking one more blow for quality in-ear headphones rather than tinny, plastic outer-ear headsets, here's my review of the latest 3D-printed (yes, really) design from Brainwavz. 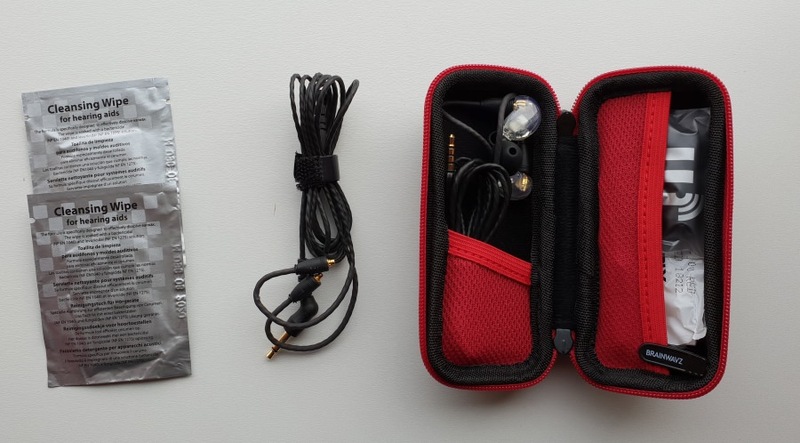 The IDOL 4 Pro pictured below came with decent JBL in-ear headphones, so is perhaps not the perfect example phone to use as part of the use case here. But I wanted to feature it because it has the best DAC built into any Windows-powered phone, period. And I wanted to see what the Brainwavz accessory could really do. 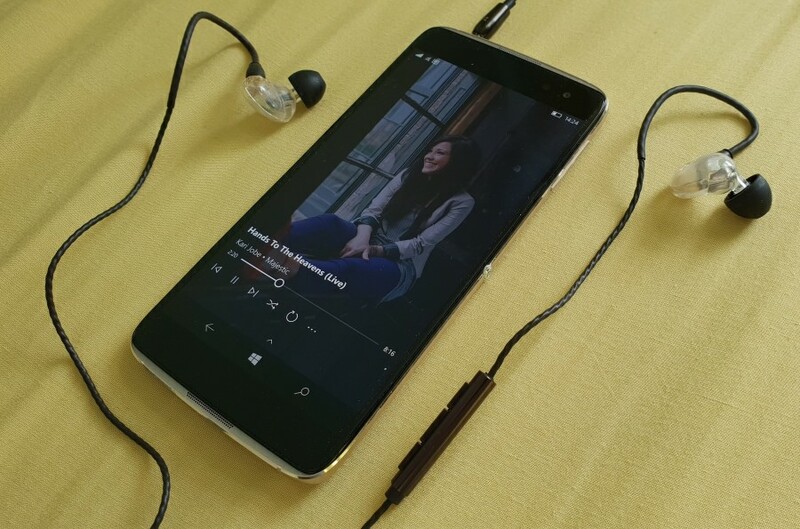 Most older Lumias came with some fairly low-end in-ear headphones (usually colour coded to the phone's plastic) and newer Lumias didn't ship with headphones at all. So there's a good chance that buying new/replacement headphones has been something that you've been involved with several times over the last year or so. Typically, cheap Lumia-replacement in-ears cost around £10-£15, and for this you get what you pay for - OK sound, but nothing special. And of course you don't want to go down the outer-ear route, typified by Apple's in-box headphones and Airpods, as these leak audio in and out, plus you can't get very good fidelity. Which made me ask for a set of Brainwavz B200, which retail at just under £100 in the UK. What do you get for this sort of price and how do they sound? The spare cable is there because there's nothing so annoying with a good quality pair of headphones as when the cable breaks and you have to ditch the expensive bit (the drivers/earpieces) because of a broken wire. So here the cables plug onto the earpieces and if, a year down the road, you manage to break the cable somehow (though it's rubberised and pretty tough) then you just plug on the new cable and you're good to go (though note that the spare lacks media controls, which is odd). There are also a couple of cleansing wipes for cleaning ear wax, which is also fair enough. 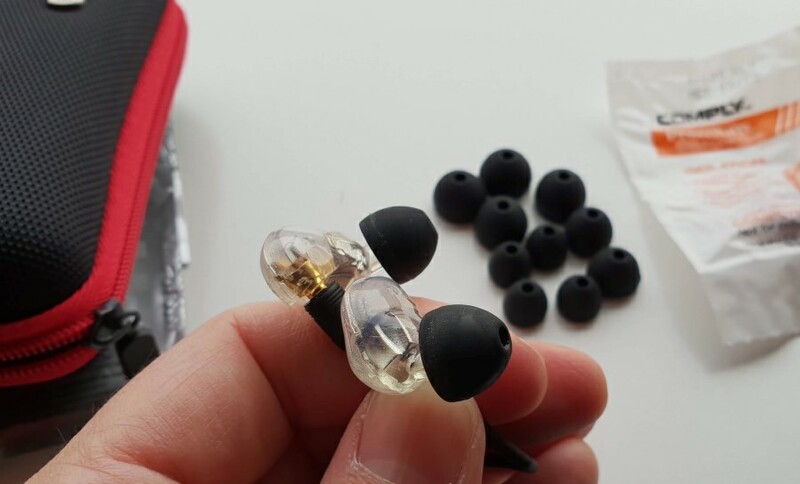 Inside the carry pouch are the main B200s themselves, along with no less than five different spare pairs of silicone buds, in varying sizes. Plus a pair of 'Comply' buds - these are superb at staying put, as they (literally) expand into your ear canal, but I've found in the past that they don't last very long - I used to go through a pair of Comply buds every month - they would degrade and fall apart! So best stick to the long lasting silicone ones for now. 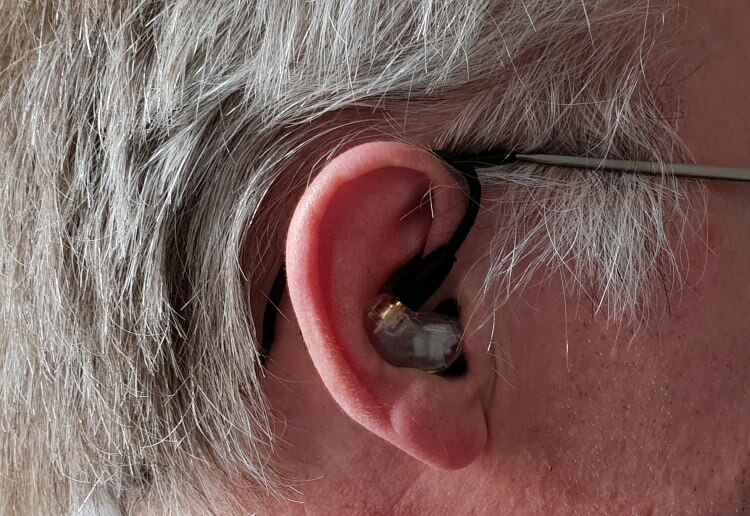 The B200 design itself is ergonomically moulded to the average ear (see the in-situ photo further below) and is 3D-printed, with each side of the 'lump' having either the connector for the snap on lead or the cuboid driver assembly - and being transparent, you can see everything. Which is kind of cool. I was a bit disappointed by the limited size of the driver, since physical/plan area of a sound driver is normally proportional to how much bass it can generate. But more on that later. The 'lumps' are marked L or R so that you don't mix them up and you'll be curious to note that the cord nearest the earpieces is pre-curved. This is because this is explicitly an over-ear design - you pop the buds in and then run the cable over the top of your ears - this means that they stay put and don't get dragged down and out by the weight of the cables. * I'm not that grey, but the hair over my ears was first to go. Don't worry, I'm younger than I look in this crop! You can see how the moulded/3D-printed 'lumps' nestle into the pinna (outer ear), keeping the silicone tips solidly in the ear canal. In practise, this works very well. It takes a few seconds to master putting the B200 set on, but once in place you can walk or jog and these things don't budge at all. There are the usual caveats over the audio file bitrate and encoding, but I tested with a range of music types, all encoded at high bitrate. My conclusions? 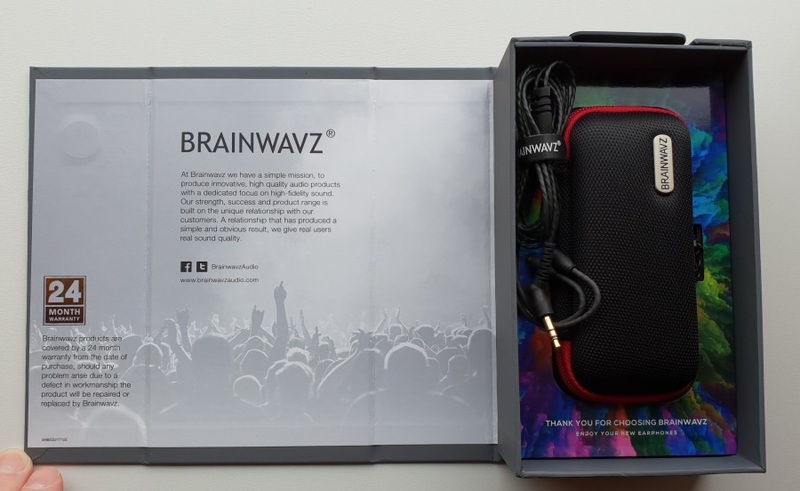 The Brainwavz B200 is a very solid set of headphones. Note the use of the word 'solid'. 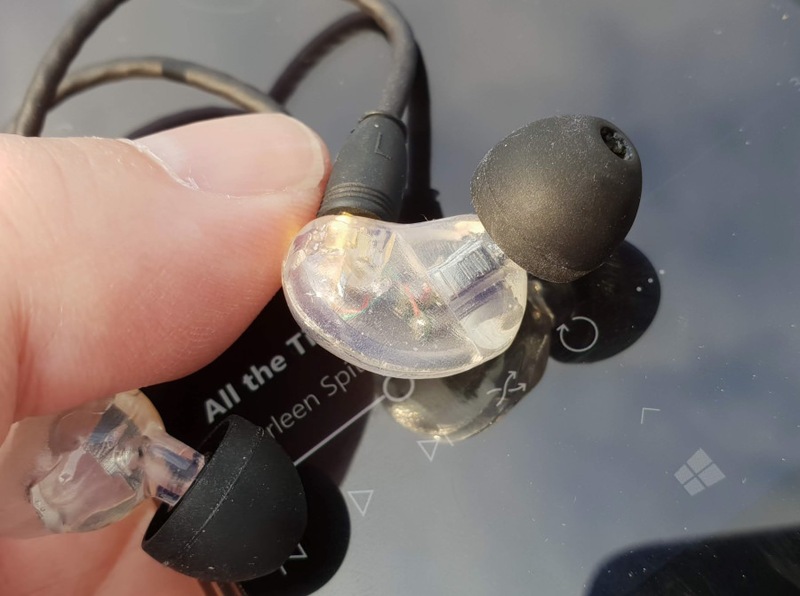 On the B200 product page, it says "this dual driver earphone has been tuned to produce a balanced and accurate sound signature, with little to no colouring, listen to your music as the artist intended it to be heard." And this is absolutely spot on - I'd class the frequency reproduction here as 100% neutral. There's no exagerated bass (beloved of, for example, 'Beats' products), no loss of high treble (as typically found in cheaper ear buds) - you just get a flat EQ render of your music. You can tell it's a high quality product because the volume is nice and high - the IDOL 4 Pro DAC and amp puts out quite a bit of volume and I couldn't go above 22/30 on Windows 10 Mobile in Groove Music without hurting my ears. Now, I should mention that these haven't displaced my favourite Marshall Mode in-ears - these originally retailed at £50 or so and have superb bass rendition - and I do like a nice warm and deep bass in my progressive rock(!) But the B200's certainly provide a clear and undistorted sound - classical music sounded wonderful, while the familiar in-ear design meant that the outside world was completely blocked out. The inline media controls worked well with Windows 10 Mobile here - and also with music players on Android, since I also tested with that. I can't use 'dumb' headphones, even those with just a 'play/pause/answer' button - I need volume up/down as well, and the B200 delivers. Now to the price (getting on for £100) - this only makes sense once you take the whole package. The moulded and detachable cord, the spare cord and plug should you break the original, the extra sets of buds, the Comply inclusion, the deluxe carry case - heck, even the earwax wipes. You're buying a kit that's going to last a long time and deliver a 'reference' audio experience with the snugly fitting 'frosted' modules and the way the cord curves over your ears.